Express way to verify news! Everyone wants the perpetrators of the ghastly deed – the derailing of Jnaneshwari Express – not only to be nailed in a court of law, but also to be handed down exemplary punishment for murdering over 140 innocent lives. The Bengal police have arrested People’s Committee Against Police Atrocities (PCAPA) member Bapi Mahato, who they claim is the maser mind behind the heinous & gory sabotage. Investigations are still on and the police are yet to file a charge sheet. Indian Express’s points person for reporting on this important investigation is Madhuparna Das. S/he posted following report dated 24th June as an update to her/his earlier reports on the investigations into this horrific crime. S/he begins her report on a very cocksure note thus : “On May 29, a day after their act of sabotage derailed the Mumbai-bound Jnaneswari Express and killed 148 people, pro-Maoist PCAPA member Bapi Mahato organized a party in a village in Manikpara in West Bengal to celebrate the “Successful Operation”. She has “prejudged the case” on 4 counts in a single sentence; (1) Bapi Mahato is a member of PCAPA, (2) PCAPA is a pro-Maoist outfit, (3) He led the sabotage operation, and (4) He partied to celebrate it’s success. Then she goes onto reproduce a conversation taped by the police in which Bapi reportedly says, “Kaaj Hoyeche to? Etai sab, Aar kichi bhavar darkar nei”. These sentences in Bengali are inserted probably to impart “authentic flavour” to the report. But she is not satisfied with this authentication and adds gravitas to her story till now based on police sources (?) by looking for corroboration. And whom does she turn to for verification? Who else but to the chief of police in West Bengal, DGP Bhupinder Singh. Isn’t it logical that the police version should be verified from the police themselves? After all they alone would know what is the “truth” in the story put forward by them. DGP is obliging. He not only confirms the veracity of what she has learnt from his force, but manages an expansive generalization : “Generally after every successful ambush or operation, they celebrate”. 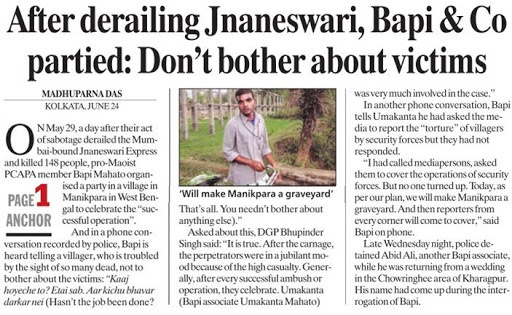 When & if the truth about the Jnaneswari derailment ultimately comes out, it may happen that the police, Bhupinder Singh and Das are eventually vindicated. But until then what should one make of this embedded journalism of courage which credulously mouths the police version without any doubts? There is luckily a precedence which may help decide the matter for the moment. On 1st October last year Indian Express put out a report in the wake of the arrest of PCAPA leader, Chhatradhar Mahato. 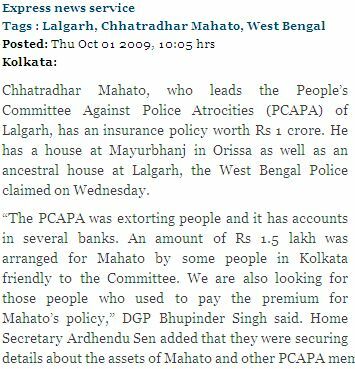 West Bengal police had then claimed that PCAPA leader has an insurance policy worth Rs. 10 Million, a house at Mayurbhunj in Orissa, and an ancestral home in Lalgarh. DGP Bhupinder Singh had said that they were looking for people who paid the premium on the policy. So the police had not an iota of doubt about the veracity of the story they were putting forward. Yet just 10 days later IE reported, “But we are yet to get any confirmation of Chhatradhar Mahato’s insurance policy worth Rs 1 crore and his property in Mayurbhanj. We do not have any concrete proof. He must have got the property and the policy in fake names, said state DGP Bhupindar Singh“. There is a climb down but the insinuation continues. Even after nine months the WB police have still not managed to locate any of those assets allegedly possessed by Chhatradhar Mahato.